Animal Alphabet Series. 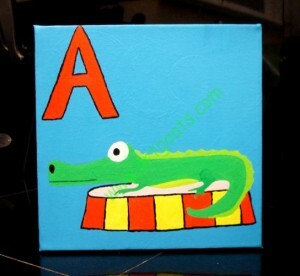 A for Alligator. This alligator is on the stage for all the world to see. Check him out! Mr. Alligator is ready to teach your kids the first letter of the alphabet. “A” is the letter of the day. Original acrylic painting on 8″x8″x1.5″ museum wrapped canvas. 1 of 3 piece set. Ready to hang or free standing.